Budds' Chev | Blog | Colorado vs. Silverado: How Much Truck Do You Need? Colorado vs. Silverado: How Much Truck Do You Need? If you’re thinking about a truck Chevy has plenty to choose from. 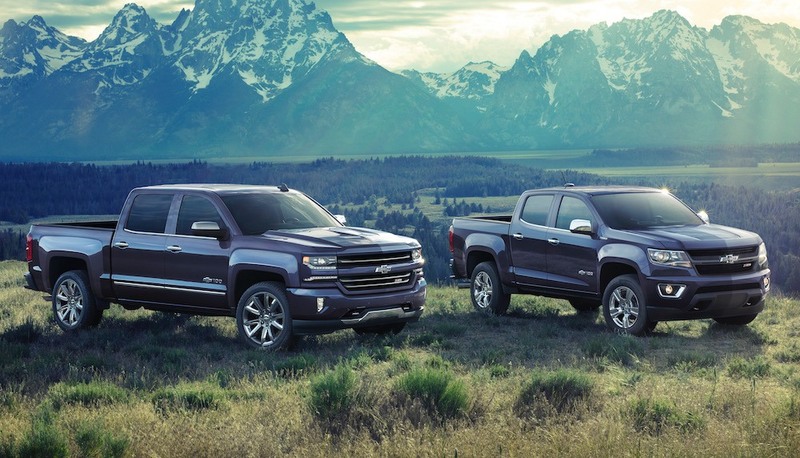 At one end of the scale there’s the Colorado and at the other the Silverado 3500HD. The 3500 looks very cool with rear fenders flaring out over massive dually wheels, but be honest… where are you going to park it? Unless you’re in construction or need the towing power of a semi it’s the smaller trucks that make most sense—and by “smaller” we mean the Silverado 1500 and the Colorado. Here we’re going to compare and contrast the two. When you’ve finished reading you should have a better idea of which would suit you best. The Silverado comes with a choice of Regular, Double and Crew cabs. The first is a two-door, the second has short rear doors and the third has long rear doors, (and more back seat legroom.) It also comes with three different box lengths. The Regular cab gets either a 6′ 6” box or one of 8′. The longer Double cab comes with only a 6′ 6” box and the Crew cab has a box of either 5′ 8” or 6′ 6”. Things are simpler with the Colorado which offers just two cabs, Extended and Crew, and boxes of 5′ 2” and 6′ 2”. Both these cabs are four-door. With so many engine choices there’s not room here to review all the power and torque numbers. Bigger engines have higher outputs, but the Colorado’s diesel is an interesting outlier. This makes 500Nm of torque, just 19 Nm less than the 5.3 liter V8 in the Silverado produces! These numbers are governed by the cab, box, engine and drive options selected. To get exact figures for a specific configuration come down to Budds’ and talk to a sales professional. However, we’ll summarize here. The maximum you can put in the back of a Silverado is 1,020 kg. For the Colorado the limit is 710 kg. When it comes to towing, and these numbers assume the appropriate tow package is fitted, the Silverado will haul up to 5,670 kg. Maximum for the Colorado is 3,493 kg. Silverado trims range from the utilitarian Work Truck through LS, Custom, LT and LTZ to the luxurious High Country. In addition, there are a huge range of special editions and options packages. Even though Chevy sell a lot of Silverados it’s possible you could own one that’s almost unique. Colorado buyers have slightly fewer choices, (which might make the decision easier.) Trims go from Work Truck through LT and Z71 to ZR2, and again, there are various packages and special editions to consider. If box size, payload and trailering are your top concerns, it has to be the Silverado. However, if you’re not going to load your truck up the max, the Colorado could serve you very well. The cabs are plenty spacious, you still get a high seating position and there’s good ground clearance and plenty of hauling ability. What you also get though is a somewhat smaller package that’s more maneuverable, easier to park and burns less fuel. Maybe you’ve already decided which is the truck for you. If that’s the case, let’s talk. But if you’re on the fence, come and take a look at Budds’. You might be surprised, and we’re sure you’ll be impressed.